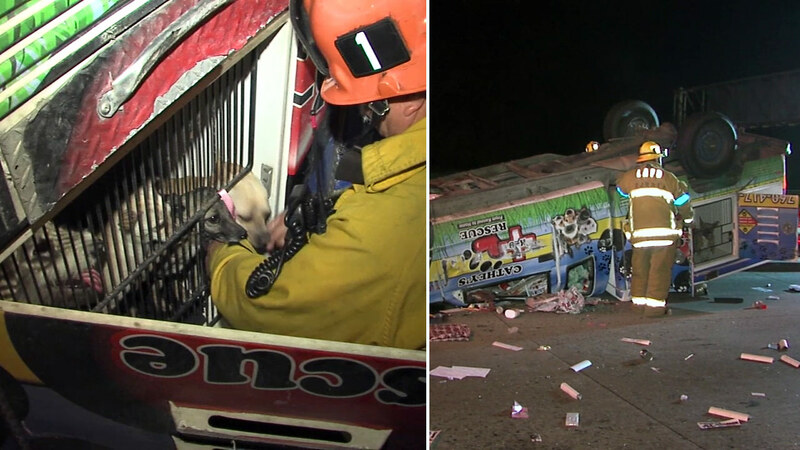 LOS ANGELES -- A truck carrying 15 canine rescues was involved in a multi-vehicle rollover crash on the 5 Freeway Saturday evening. The California Highway Patrol said the crash happened on the Northbound 5 Freeway about half a mile from Stadium Way exit around 10:55 p.m. Both CHP and the Los Angeles Fire Department responded to the scene. Three vehicles were involved in the crash; the truck carrying the dogs, a box truck and a car, according to officials. CHP said one person was taken to the hospital after suffering injuries in the crash. The truck transporting the canines was decorated with logos for Cathey's K-9 Rescue. On its Facebook page, Cathey's K-9 Rescue said, "Nancy Cathey was in a horrible traffic accident. A drunk driver had hit her in the rear end and she spun out and flipped over a few times, resting upside-down." The Facebook page said Cathey was heading home after a pet adoption event when the crash occurred. Cathey was taken to the emergency room and the truck was a total loss, according to the Facebook page. Officials and the Facebook page said all the dogs were accounted for and were not hurt. The canines were taken in by local shelters. Police did not confirm if a suspect was arrested in connection with the crash, but video from the scene showed a male in handcuffs being led away from the scene. A GoFundMe page has been set up to help Cathey with medical bills and to replace her truck. If you would like to learn more about how you can donate, click here.